For the uninitiated, Search Engine Optimization (SEO) can be very overwhelming. Contrary to popular belief, however, there are many ways you can boost your company’s visibility on major search engines beyond optimizing your website. We have previously mentioned how Google loves it when sites link to other sites. If high-ranking websites link back to your page, this will increase your site’s search ranking. This is where online business directories come into the picture. Online business directories are websites that help users find local businesses in their area. These sites are typically highly ranked and offer an opportunity for you to control how your business is listed online. Below are six of the most essential business directories where your company needs to be listed. Google is the Three-Hundred Pound Gorilla when it comes to online search. It makes sense that claiming your Google Listing will improve your local search results. Claiming your business listing on Google will not only optimize your spot on Google Maps but will also give you a Google+ page that is also useful as a social platform. Keep in mind that Google+ posts are indexed on Google, while Facebook and Twitter posts are not! Claiming your Google listing is relatively easy. Once you find your current listing or create a new one (if you are not currently listed), Google will send a verification postcard to your physical address. When you receive your verification postcard and sign in to enter the code listed on the back (this should take less than a week), Google+ lets you flesh out your profile with photos, categories and a [keyword heavy] business description. Don’t forget that Google also allows customers to review your business. If you have at least five customer reviews, your star rating will come up on search. This can be a very valuable tool for standing out when people search for your business. Even if you do not want to claim your profiles on other listing directories, your business MUST be on Google! While Bing is certainly no Google when it comes to search, it is still a very highly-ranked search engine with its own benefits. Just like Google, Bing offers its own local business directory. Getting started on Bing is easy. Simply find your existing listing (or create a new one if you are not listed) and click the “Is This Your Business?” link at the very bottom. You will then be prompted to edit your company information. Bing offers a few different options for verifying your business listing. The easiest is to do it via email if you have an email with your website’s domain name. If not, you may opt for phone or postcard verification. While Yahoo has certainly seen better days, it is still a very prominent search engine with a dedicated user base. Unfortunately, Yahoo’s directory services are a little less user-friendly than Google or Bing. While Yahoo originally offered both a Premium and a Basic listing for businesses, they recently have partnered with premium online listing service, Yext. Yext is a popular “Power Listing” service that allows business owners to publish information across over 50 different business directories. While this sounds great, their services are known to be very expensive and force you to pay per directory per month. It is unclear how Yahoo will handle basic listings through Yext but they claim the feature will be available sometime this month. Wait– Facebook has a business directory?! Actually, Facebook has been a very popular option for companies in the past five or so years. Not only is it the world’s most popular social networking site but it is also the world’s [second] most popular business directory. Facebook is the is most popular website on the internet next to Google so it makes sense to create a page for your business. When creating your page, include all essential information including name, phone number, address, email, website, etc. Facebook also allows you to spruce up your page with a profile picture and a cover photo. In addition, Facebook recently implemented a feature which allows companies to verify their phone number. Doing so will get you a shiny new “verified” badge next to your business name. Unlike other business directories where it is best to have a separate page for each location, you should have one central Facebook page for your company. This will decrease the amount of time it will take to update each of your pages and will consolidate the “likes” for all of your locations. Yelp is an extremely popular business review site that allows users to rate companies. Claiming your company’s Yelp page will not only let you optimize your business information but will let’s you reply to both positive and negative reviews left by your customers. Yelp also lets you control the photos posted by your customers. Did someone post an unflattering photo of your products? Yelp lets you simply delete it. Claiming your Yelp profile is very easy if you have access to your business phone. All you have to do is send an automated call to your location, input the necessary code and you’re done! You may have already noticed that listing directories seem to be auto-populated with information about your company. But where does this information come from? This is where Data Aggregators come into play. The majority of listing directories, including Google itself are actually powers by companies such as Infogroup, Localeze, Acxiom and Factual. 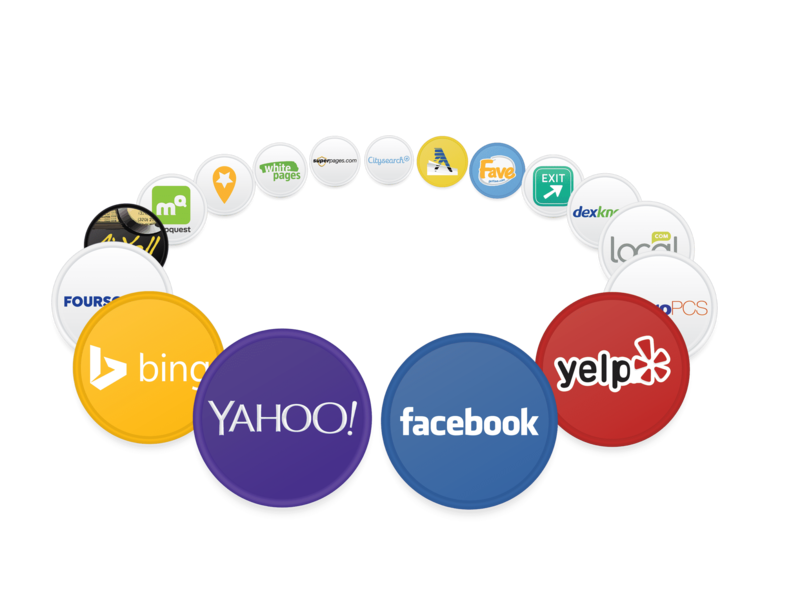 When you correct your information on these services, it will actually feed it to other listing directories over time. Unfortunately, claiming your business on these websites comes with varying levels of frustration. Do you need help with your company’s SEO? Dallas Riffle Media is Cleveland’s premier full-service marketing agency. For a free estimate, give us a call at (330) 274-7658 or visit our website. For more information about how to grow your business, be sure to follow us on Facebook, Twitter or Google+.